Grain leather driver with split leather palm patch. Keystone thumb for comfort and mobility. Shirred elastic back. 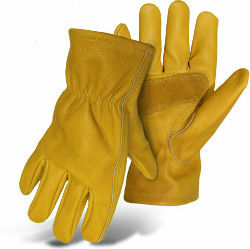 Open cuff allows glove material to extend below the wrist for an open design, making the gloves easy to slip on and remove.